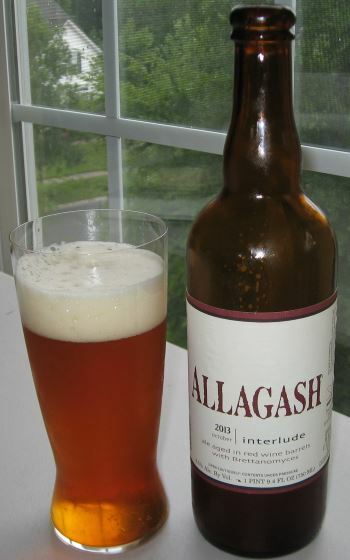 Interlude is a Saison style ale from the Allagash Brewing Company of Maine. It’s one of their specialty beers, not a year-round offering, and the version that I’m tasting tonight, bottled in October 2013, is indeed special. Farmhouse ales tend to be complex and interesting, but generally (not always) on the milder side of the flavor spectrum. This is one of the outliers. The addition of wild yeast (Brettanomyces) gives this the brilliant, sharp, tangy, fruity flavor of a wild lambic. One of the first things I noticed about this beer is it didn’t build a particularly large head, and the head that was built dissipated quickly. 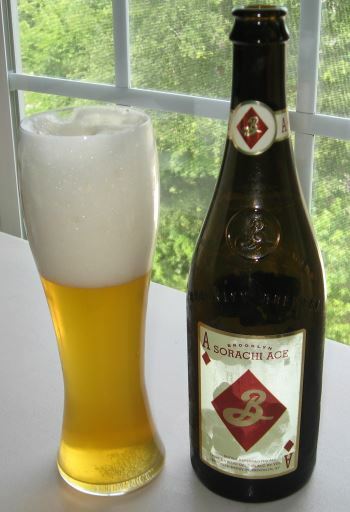 The nose is mild with pear and apricot, and a tiny hint of the yeast notes typical of a Belgian style. The middle is explosively flavorful and mouth-puckeringly tart. More pear, some raspberry, and a lot of grape here. The tartness fades into sweetness in the finish, with more grape and a bit of sweet bread, with a strong undercurrent of heat from the alcohol, which is a not-insubstantial 9.5% ABV. The body is medium weight, not particularly heavy, but it packs a punch. One of the best beers I’ve had this year. This entry was posted in Reviews and tagged Ale, Allagash, Belgian Ale, Farmhouse Ale, Maine, Saison on August 19, 2014 by Xander. 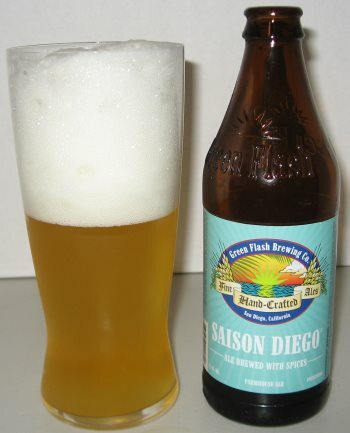 Saison Diego is a Belgian Saison, or Farmhouse Ale, from the Green Flash Brewing Co. of San Diego. The style is known for its spices, and Green Flash has done a really nice job of staying true to that style. 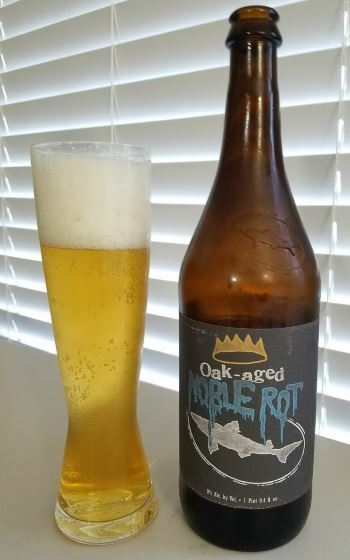 With spicy Czech hops, orange zest, ginger, and grains of paradise, this is a flavorful old world beer, very different from some of the super piney bitter west-coast style ales that Green Flash is known for, but this is just as good a beer. The nose is bready, with wheat and yeast and a bit of orange. The middle is spicy, with the orange, the hops, and the grains of paradise coming to the fore. The finish is dry and dusty, with fading notes of cinnamon and slightly bitter orange peel. 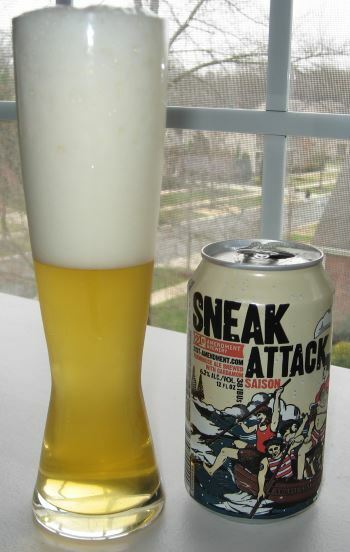 This is a really nice beer, and one of the better Saisons I’ve tried. I give it a thumbs up. 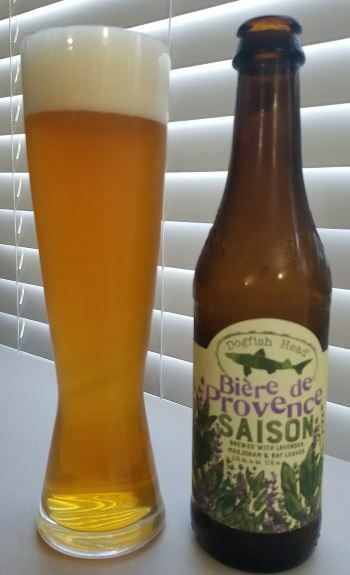 This entry was posted in Reviews and tagged Belgian Saison, California, Farmhouse Ale, Green Flash, Saison on August 2, 2013 by Xander.